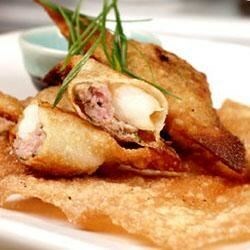 "I love dumplings and have come up with this recipe using all ingredients that I like. The dumplings consist of pork, shrimp, watercress, water chestnuts, and assorted seasonings, and they are absolutely delicious!" In a large bowl, combine the pork, watercress, water chestnuts, green onion, oyster sauce, sesame oil, garlic, soy sauce, ground white pepper and salt and mix together well. Place 1/2 teaspoonful of this filling onto each dumpling skin. Place 1 shrimp on the filling, slightly wet the edge of the dumpling skin, fold over and pinch with your fingers to form a seal all the way around. To cook: Pan fry the dumplings in a large skillet over medium heat with oil for 15 minutes, turning over halfway through OR Place them in a pot of boiling water for 10 minutes; drain and serve in hot chicken broth. Sorry, not sure if I did something wrong, but I went by the recipe, and these just did not have as much flavor as I was expecting. Pretty bland. Won't be making again.